Russell Peters in Montreal or Quebec City? Inform me about the next events for Russell Peters. Enroll yourself to our priority waiting list for Russell Peters to be alerted when new tickets are available. Filling this form doesn't engage you to any purchase. Russell Peters is an Ontarian stand-up comedian and actor born in Toronto. Being of Indian descent, his comedy often approaches some themes like racism, human relationships, multiculturalism and of course Indian culture. He hosted the Juno Awards two times in 2008 and 2009. 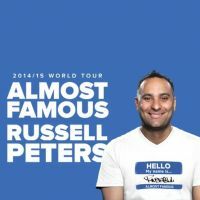 Come and laugh with Russell Peters at the Bell Centre in May 2015. Call our ticket office for the best tickets available for Russell Peters.